Trésor caché dans le secteur de l'océan! Au beau milieu de la zone animée de Boardwalk, passez des nuits d’été dans les parties communes et passez des moments agréables en famille dans cette belle escapade à la plage! Cette unité peut accueillir confortablement 6 adultes et est parfait pour les familles à la recherche d'une location de vacances propre et mise à jour pour un prix abordable. L'unité dispose de deux chambres et une salle de bains et dispose d'un intérieur entièrement rénové, y compris une laveuse et une sécheuse, Wi-Fi, télévision par câble, une cuisine bien approvisionnée et une grande télévision à écran plat! Seahorse Shanty est situé dans le complexe Oceanlife Gardens et est prêt à vous fournir les vacances parfaites au bord de la mer! Linge de maison inclus dans la location. This rental was "mehh." 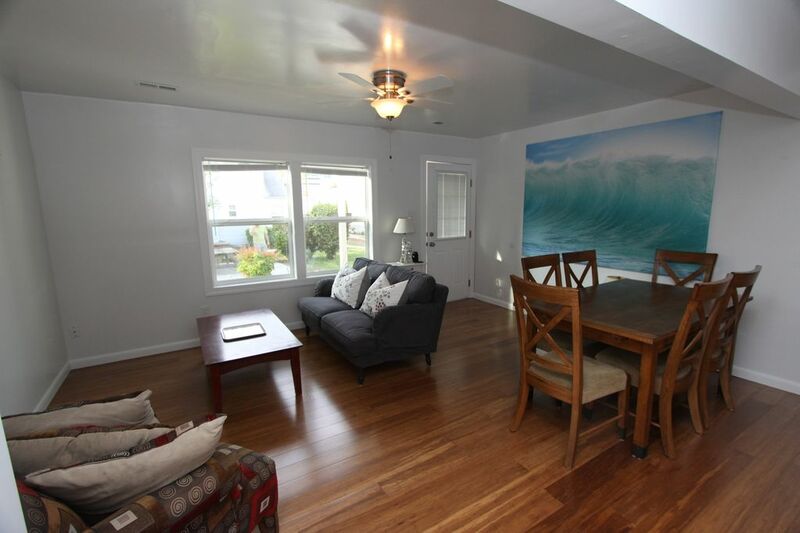 First, the listing says "Beach View" under location type, which is false and upsetting. I choose this rental to fit our group of 4, and my MIL's only request was to have a view of the water (for the weekend when she was burying her husband at sea). The misleading listing set our weekend off on the wrong foot. The two bedrooms were as presented in the photos. There was one set of linens for each bed, and a single, low-quality body towel for each person. The beds were comfortable, and the rooms had good lighting. The common space was acceptable. The furniture was low quality but was reasonable for a rental. The dining table fit 5, pushed against the wall. The kitchen was oddly stocked. For example, there were 2 pie pans and 4 pairs of scissors, but no wine glasses. We were able to prepare our meals in the kitchen, but did have to buy a few essential items to replace the broken/missing essentials (including a wine opener and foil). While there was a dishwasher, there was no soap provided. The bathroom was clean and worked well. There was good water pressure in the shower. One small shampoo bottle was provided; the soup dispenser was full of watered down dish soap. Overall, the rental was a "mehh." It's a few easy blocks to the beach in a quiet neighborhood. The problem seems to be with the low standards of the management company. Renters have higher expectations now that there's better competition on the market (AirBnB) that gives better customer experiences. With a better stocked kitchen and more basics provided (soup, shampoo, extra towels) and the listing updated to be clear it is NOT "beach view", this property has a lot of potential. Everything was perfect! From the price to the house and location!! Thank you!! What a wonderful stay we had! I had won the week for reposting an Instagram photo. I normally go all the way to NC for my vacations but being that I have been introduced to Anchor Realty I will definitely use them in the future and would recommend them! Wonderful stay, easy check out and check in. House was quaint and perfect for two couples. Will be back for sure! We had a good experience. This rental only has parking for 1 car and is an alley next to rental. Unit is small but served our purpose for a long weeeknd. Staff was great. This is the seventh stay I have had with Matt ,Scott and Ashely and the Great Anchor Team and every stay has just gotten better . When I come to the Beach I always call Anchor because they bend over backwards to make your stay a enjoyable one , there is not enough good things that I can say except .Thank you very much and I look forward to seeing you next year. We are so glad to hear that you enjoyed your time at Seahorse Shanty and hope to see you again for summers to come! We loved it there and it was perfect for our family. The kids did great with the walk to the beach. Thank you for your review. We are happy to hear that you enjoyed your stay and love Virginia Beach as much as we do. Visit again soon! Tarifs et disponibilité sont sujets à changement.